I need to work on this whole blogging-before-10-pm thing. You know, along with the blogging-more-than-once-a-week thing. There's so many things! Speaking of things... this post is a let's-catch-up-on-Jessica's-life thing. See what I did there? More things. You're welcome. Let's begin with the whole running thing since, you know... I guess that's what this blog is about. I mean, mostly it's about things I want to eat, not fitting into my pants, and ridiculous pictures of me, but we can pretend it has something to do with fitness, right? In case you're wondering what happened to Week Eight, Day Three... I skipped it. And yes, that was my second seven miler, and yes, it was probably not my greatest decision in terms of running. But the night before I was supposed to do the run, I slept horribly (nightmares, tossing and turning, waking up every hour... the whole shebang) and so I woke up feeling awful. Plus, it would have meant losing about two hours of David time. I don't get that much David time, so I didn't want to lose it. David time did include some running this week though - we did the 3.20 mile run together on our two year anniversary. How cute is that?! I'll give you a hint. Super cute. 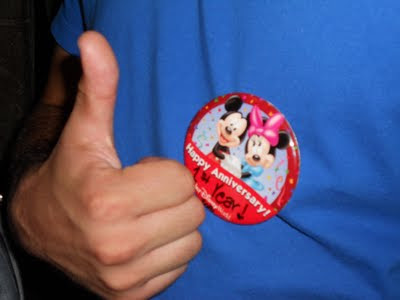 Pretty soon we'll be picking up another set of those buttons (but from Disneyland this time) and getting 2nd year written on there. I can't believe it's been two years. I am a lucky girl, kids. David really was a gem on our anniversary... the day started with me going to work, which is not exactly a romantic beginning. But he came with me and sat through an entire Weight Watchers meeting about vegetarian meals because he is an incredibly patient and tolerant guy. Then of course I had to be stressed out and difficult for most of the day because, well, that's my specialty. Luckily, I have a great boyfriend (sorry, excuse the gushing) who was willing to postpone relaxing and seeing a romantic movie with me so that we could go for a run in the heat and humidity. Doesn't sound like a great anniversary, but it made me feel SO MUCH BETTER. I actually started crying at the end of the run. It was one of those runs. I was just so damn proud and happy... we maintained an 8:45 pace for about two minutes on this run, and I just got so emotional about it because two years ago when I'd just started Weight Watchers and just started running, I never dreamed I could run that fast. 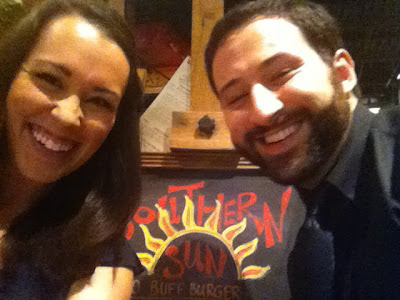 But I stopped blubbering eventually, and we got dressed up and went to the first place we had our very first date (and I drank a beer even though I hate beer because I was trying to impress him) - the Southern Sun. Yes, it is a casual pub. And yes, we dressed up. If I was a real blogger, I would have thought ahead and brought my nice DSLR that is gathering dust. But I didn't. I brought my iPhone. So I have gross quality photos to remember our special day. My hair is blocking the "S" of "Southern," but you get the idea. It was honestly one of the best nights I've had in a long time. 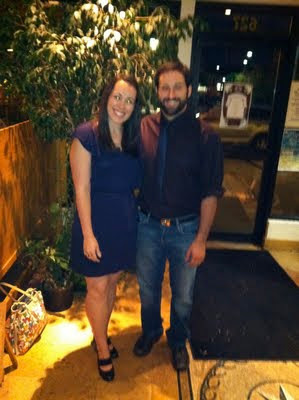 It was so fun to get all dressed up and fancy together, and we had such a great first date at the Southern Sun that it was wonderful to kind of relive it (minus the beer). We ended up having dinner there and then going to the Cheesecake Factory to share a slice of cheesecake. And it started raining while we were inside, so my chivalrous David went and got the car and picked me up in the rain. He is the absolute best and I adore him. The second run (yesterday's) was sans David, unfortunately, as he got back to California on Monday. It was a pretty good easy run, with the exception of the weather. I had set my alarm for 6 am, and when I woke up, it was already 70 degrees outside. Not a good start. It was also humid. And it was the second day of school, so instead of running around a peaceful and deserted neighborhood, I was running around a neighborhood filled with kids rushing off to catch the bus. Um... too many people seeing me in spandex. Oy. Other things worth mentioning from the past week include me getting a job offer from Nordstrom and then having it brutally ripped away. Long story short, there must have been a serious breakdown in communication because I'm still reeling from this one. I gave a couple great interviews (including one to the department manager) and then a few days later, I got a call from the department manager essentially offering me the job and going through the training schedule with me, how the commission in the department worked, all the details and nitty gritty. The only problem was that she needed me to start on the 31st and I had already booked a trip back to Florida for this weekend to get some seasonal hours in, and wouldn't come back until the 1st. But I wanted the job so I changed the flight. Big mistake... over the course of the following four days after the job offer, it went from "the job is yours if you can work a closing shift on the 31st" to the department manager ignoring my calls and eventually to me calling 16 hours before I was supposed to start training because things still hadn't been solidified and hearing "oh... we decided to go with someone else." Ouch. The ego was bruised enough to consider boycotting Nordstrom for about 10 minutes before I remembered I love Nordstrom. Damn. And that's pretty much my life, or at least the exciting bits. Now... TRIPLE TANGENT TWEDNESDAY! With a surprise. Get excited.